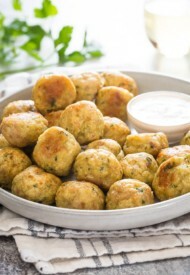 Need a tasty appetizer in less than 30 minutes to feed a crowd? I have a perfect answer for ya. 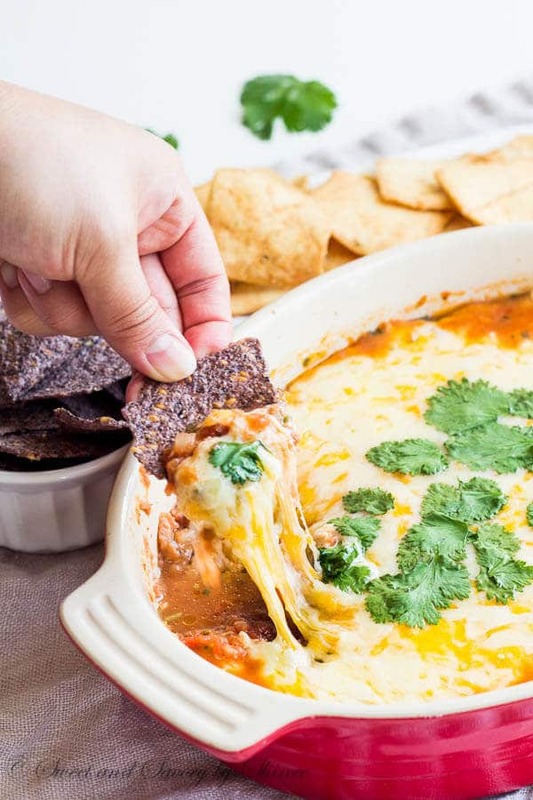 This 3-ingredient bean dip is cheesy goodness with ton of flavor and comes together without much effort. UPDATE: This’s Day 3 of 5 Days of Cheesy Dip Series. If you missed the previous recipes, here’s Day 1 and Day 2. Also, I made a quick video to show you just how easy it is to make this cheesy bean dip. It’s football season! To me it’s all about FOOD!! Lots of dips, chicken wings and beer, and then half-time show. 🙂 Anyone else is in for anything but the game? 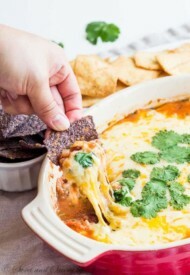 Anyway, this 3-ingredient cheesy bean dip is seriously delicious and super simple to make. Yes, just 3 (THREE!) 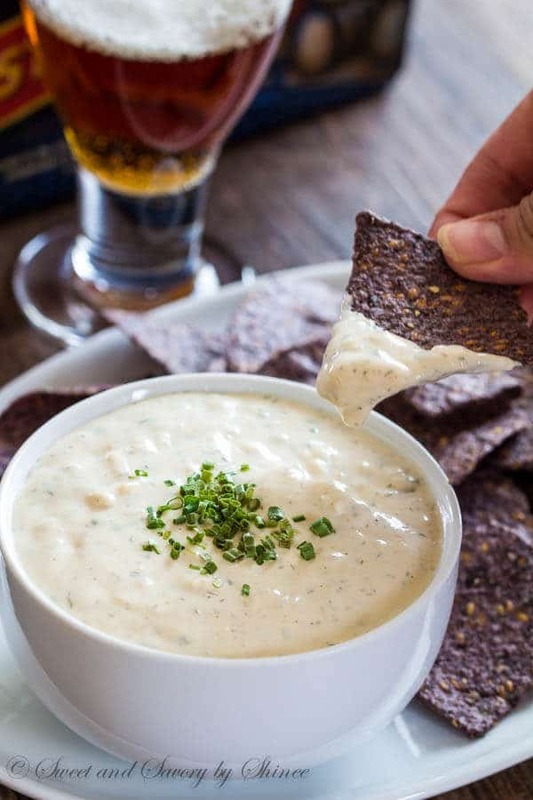 ingredients and less than 30 minutes to create this cheesy, filling and incredibly delicious dip. The secret ingredients are a can of refried beans (like Old El Paso), a jar of homemade (or store-bought) salsa and a mix of cheeses of your choice. I used a mix of sharp cheddar and mozzarella, but you can use whatever you have on hand. As for salsa, make sure it’s not too runny. The thicker, the better. Or the dip will get too runny. Also, you can choose hot, medium or mild, whatever your heart desires. I love mine spicy! And since there are so few ingredients, make sure you use high-quality, tasty products. All the flavors come from these 3 ingredients, and the final product will directly correlate with the quality of original ingredients. Need a tasty appetizer in less than 30 minutes to feed a crowd? 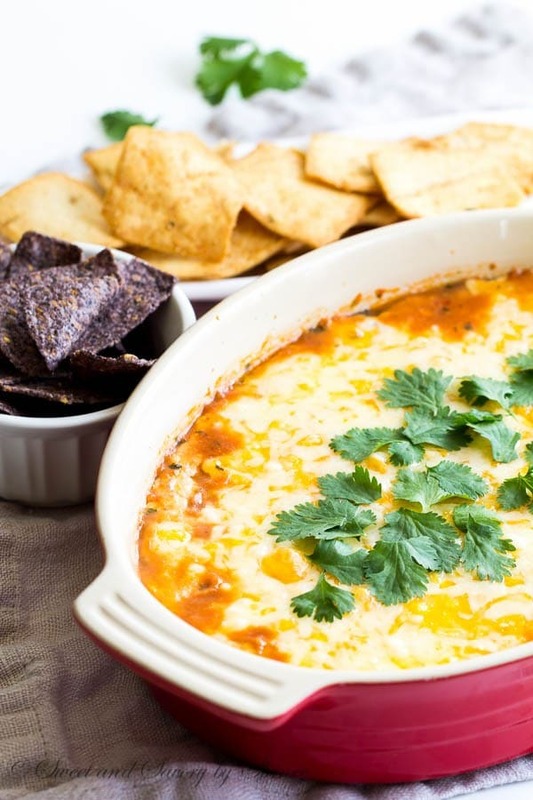 This 3-ingredient bean dip is your answer! 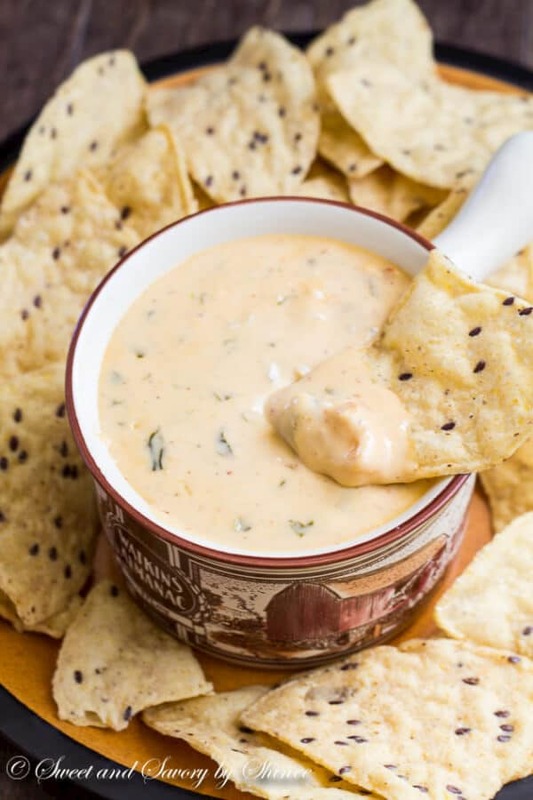 Cheesy and filling dip with ton of flavor without much effort. Preheat the oven to 350°F (175°C). Lightly spray 8×8-inch (20x20cm) baking pan with a cooking spray. Layer the beans and salsa in the prepared baking dish. Spread the cheeses evenly on top. Bake it for about 25 minutes, or until cheese is bubbly and slightly brown. 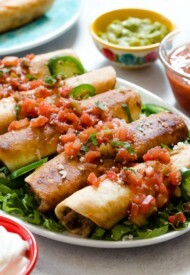 Top with fresh cilantro and serve warm with tortilla chips. Original recipe is from “The Mystery Writers of America Cookbook” by Kate White. This recipe was originally published on September 28th, 2015. Or this Hot Cheese Dip. Yes I does. Thank you. Can I make the bean dip the day before then heat it the next day. Hi, Stacy. You can layer everything and refrigerate it. Then bake it when you’re ready to serve. Hope this helps. I love that this only has three ingredients and looks SO YUMMY! I think that this would be perfect for so many events! Thanks for the share! How can anything that looks that good be that simple? Awesome! 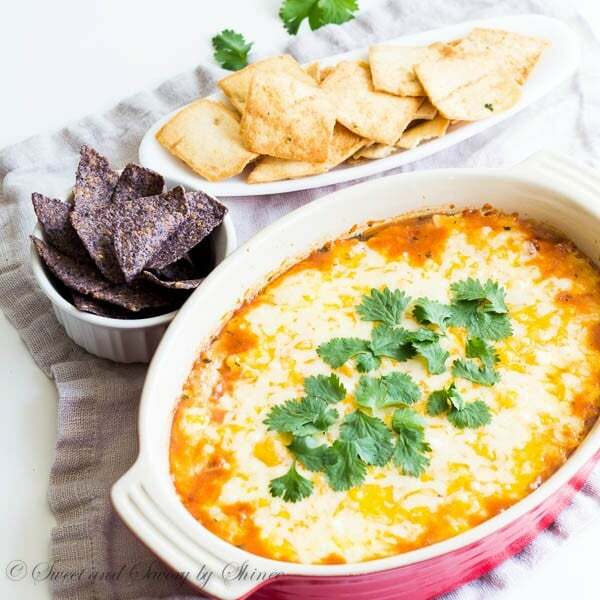 I love this recipe for bean dip. Simple but full of flavor! Pinning! This sounds so good and I love that it has just 3 ingredients! Thanks for sharing on “Best of the Weekend” so that I could discover this yummy idea. This is my kind of recipe!!! 🙂 Glad you liked it, Pam. Thanks! Yay, this looks so yummy and so simple to whip up! Sometimes other game day foods that you want to make require so much attention that it’s hard to create full game day spreads. I rely on simple recipes like this to be able to put out a few options for my friends and I to enjoy. I love all that cheesy goodness! Yes, we definitely need a few simply and easy party food ideas on hand, don’t we? 🙂 Thanks, Beeta, for stopping by.